South Lanarkshire Deer Group members delivering fresh roe venison to Calderwood Baptist Church. 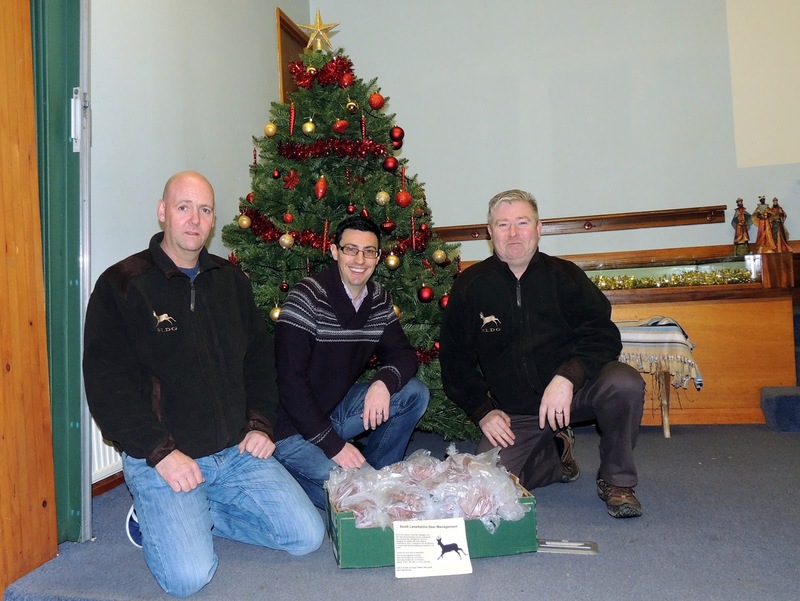 SGA members, South Lanarkshire Deer Group, are providing 150 packs of locally sourced roe venison for food bank users over Christmas. Following a successful partnership in 2015 with Calderwood Baptist Church in East Kilbride, the urban deer managers have been approached once again to provide fresh venison for families over the festive season. Calderwood Baptist Church co-ordinates East Kilbride Community Food Bank which is a partnership of local churches providing food parcels across the community. Packs of venison sausages and burgers will go out to families in the Christmas hampers; all sourced from around the local area. South Lanarkshire Deer Group are respected as an examplar group in Lowland Scotland and its members have been managing deer around towns for decades, helping to protect fields, forestry and amenity green space as well as preventing road traffic accidents. Chairman David Quarrell developed the definitive guide to managing urban deer and the group has helped social and community causes such as Friends of Langlands Moss by donating fresh local venison for events and talks. Some of the venison for the food bank will be sourced from ground leased by permission from the Forestry Commission and the group hope to progress their social and business model further in 2017. Giving their urban deer management expertise for free, the members are permitted to keep the sourced venison in return, which is mostly enjoyed by friends and family. However, with an increasing need for cost-effective deer management in urban areas and a sustainable healthy food resource clearly existing in the local area , the group- with assistance from the SGA- hope to open a chilled larder facility. This will enable local venison to be processed to the required standard and used in local restaurants, butchers and for supporting causes such as the Community Food Bank. The hope is that, within a few years, organic venison can become part of the family shopping basket at an affordable price in the Central Belt, with employment for a butcher and trainee created at the larder. “The lads are all happy to be helping again with the Food Bank,” said Chairman David Quarrell. “We fully believe there is a need for a deer management model like this in the Central Belt, and it is good to see people being able to benefit from the deer in their own area.